Just when you were thinking us women have enough body ideals to contend with, ASOS goes and pulls this sizing stunt. The vastly popular online fashion retailer has come under scrutiny for listing a pair of size 10 Pull & Bear shorts as large and it's not hard to understand why. In this day and age, women are bombarded with images of how their bodies should look and advice on how to achieve this, on a daily basis. And it's no wonder the females of today feel under more pressure than ever to conform to unrealistic beauty ideals - for which Instagram and the blogging industry are largely to blame - when one of the most popular fashion retailers among the young generation classifies a size 10 as large. ASOS is the offending party in this latest size-zero-promoting stunt: the international, online fashion stockist has listed a pair of size 10 Pull & Bear shorts as size 'L' and the Internet is understandably outraged. It was a Twitter user named Hollie who first spotted the faux pas, tweeting screenshots of the item alongside the words: "U wot m8 [sic.]" @ASOS_Us @pullandbear Can you clarify why size 10 is large?," one wrote. Another added: "@ASOS How the hell is size 10 classed as a large? When sizes 12/14 aren't even large! Great message you're sending out to girls." Another fumed: "@ASOS promoting healthy lifestyle for girls and young women by calling a size 10 large? You are disgusting and hateful." 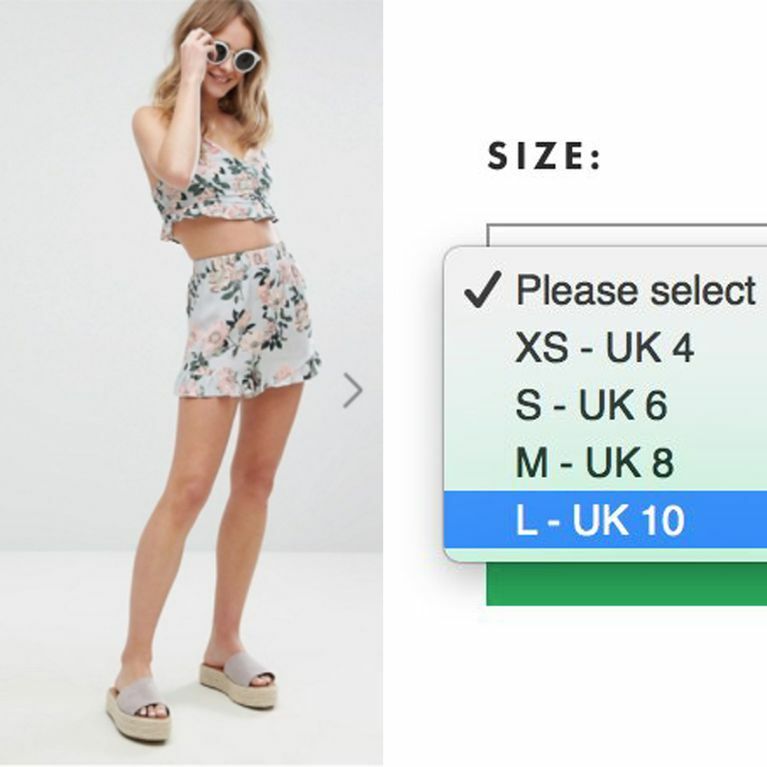 @ASOS promoting health lifestyle for girls & young women by calling a size 10 large? You are disgusting and hateful. ASOS have since apologised for the offending listing, claiming it was due to a "technical glitch". A spokesperson said in a statement: "We're really sorry for the confusion caused by the technical glitch, which meant certain Pull & Bear sizes weren't represented properly. This particular style has now been fixed and back online." They've also adjusted the sizing options on the item with every one downsizing and size 12 is now L and size 10 M, which is better but still not ideal. Hollie also isn't impressed with the change, tweeting: "How.. Did @ASOS magic-up a new size 12 (that didn't exist yesterday) over night? Wtf." It's also worth noting that Pull & Bear's original size guide matches sizes XS-XL with European dress sizes (38, 40 etc.) but not UK ones (10,12 etc. ), listing a Large as EU 40 which is a size 14. The Spanish brand is yet to comment on the matter.